Does your current portfolio still fit you? Are you taking too much risk? When was the last time you completed an accurate and up to date risk assessment to make sure you are still invested properly? We invite you to take our interactive risk assessment tool for a complimentary report. Nobel Prize Winning Science Built on the academic framework called Prospect Theory that won the Nobel Prize for Economics in 2002, this risk profile is the first-ever way to pinpoint investor risk tolerance with math, and properly engineer portfolios to fit you. The Risk Questionnaire helps you to understand your feelings and biases regarding financial risk in the context of your personal financial position. The resulting questions capture an investor's "Risk Fingerprint." As the name suggests, each investor has their own personal risk tolerance that is as unique as a fingerprint. 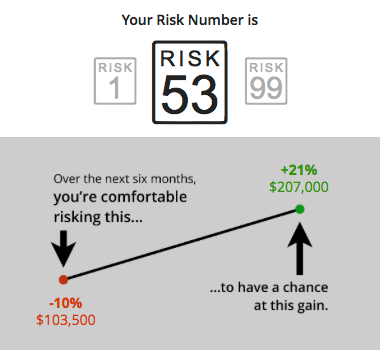 Does your current portfolio align with your Risk Number? Take our complimentary Risk Questionnaire to find out your score today.